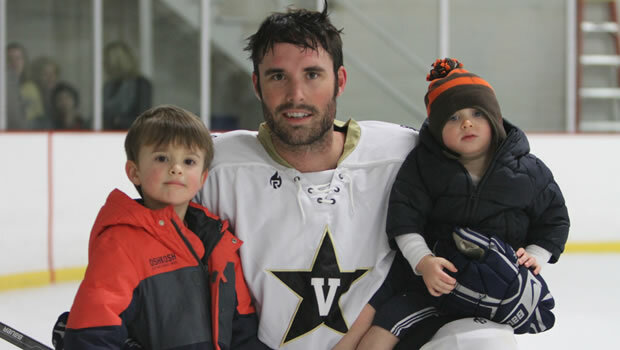 A long Christmas vacation left the Dores eager to embark on their first road trip and games of the new year. Two matchups against a strong Indiana University team managed to thrust Vanderbilt right back into the midseason swing of things. Over the course of the two games, a 5-2 Vanderbilt victory on Friday night followed by a 2-0 loss the next day, both teams found themselves fighting for every inch of ice. The weekend produced physical, penalty-ridden, yet still entertaining affairs between the two clubs. At the start of the first game, it was evident the boys in black and gold were experiencing a bad case of “bus legs.” A six-hour bus ride to Bloomington made for some sloppy play in the first period. Indiana managed to break the 0-0 deadlock with just under five minutes remaining in the period. Vanderbilt quickly kicked into gear after the Hoosier goal, and popped in two quick tallies thirty seconds apart. The first came courtesy of Brock Raffaele, and Ryan Doppelheuer managed to add another off a hustle-play that saw him bury a rebound past a helpless Indiana goaltender. Doppelheuer’s goal was his first since the opening game of the season. The junior forward is thankful to be back in action after recovering from an injury in the fall. The Commodores took its 2-1 lead into the second period knowing that the two goals were not reflective of how the team played the first period. Fortunately, the boys regrouped for a huge second period that saw the Dores add three goals. Raffaele kicked things off with a goal on the power play just two minutes into the period. Calen Leverant, playing in his first game of the season, scored later in the period off a rebound in front of the net that saw Indiana’s netminder scrambling to find the puck before Leverant was able to poke it in. Indiana managed to reduce the deficit with a late goal in the second, but the Commodores restored its three-goal lead in short order. Defenseman Steve Patalano jumped in on a rush with under a minute remaining, skating the length of the ice to tap home a rebound on a 2 on 1 opportunity. With a 5-2 lead heading into the third, Vanderbilt controlled the game through the final stanza to secure the win. Saturday night’s game was an entirely different affair defined by excessive penalties by Indiana and power play woes from Vanderbilt. An energy-filled first period only produced a single goal from Indiana. The intensity was high but it was clear that goals were going to be a very hard to come by. The second period was a different story as Indiana began to stack up penalties, but the goals did not come for Vanderbilt. The Hoosiers took six penalties in the second period alone, granting the Dores multiple power plays that included two short 5 on 3 advantages. However, the Commodores could not click offensively and the Hoosiers seemed to effortlessly kill off any penalty they took. Vanderbilt tried to regroup during the second intermission, strategizing over the power play and discussing cracks in the Hoosier defense. The opportunities at redemption were not scarce, as Indiana took four more penalties in the third period, however the Dores were still unable to capitalize. The offense was clicking, but Indiana’s goalie was more intent on preserving his shutout. A few close chances had the Commodores knocking on the door, but Indiana tallied a dagger with three minutes remaining to ensure their victory. One of the highlights of the weekend (and really the season) was the debut of “rookie” Andrew Herzog. A 27-year-old third-year law school student and father of two, “Dewey” had flirted with the prospect of skating for the club for each of his three years at Vanderbilt. Unfortunately, the timing never lined up for the Air Force graduate to don the black and gold due to family commitments and other responsibilities on the work and school fronts – that is, until this spring, Dewey’s final semester. As fate would have it, the stars finally aligned, and with the help of some babysitters “stationed” in Bloomington, Dewey was able to skate with the team for the first time. The result? Massive body checks (the likes of which the club hasn’t seen since 2011 grad Nathan Tardiff patrolled the blue line for the Commodores), tremendous leadership in the locker room, and even an assist on a rush that Doc Emrick might describe as “workman-like.” To quote Dewey’s 4-year-old son Gavin, “My daddy is great at hockey!” His Commodore teammates agree, and they are excited to have Dewey aboard for his swan-song-semester at Vanderbilt. This tough but humbling weekend has Vanderbilt excited to play out the rest of the campaign against a host of other great teams. The Dores will have to wait to rebound from the sting of its loss to Indiana, though, as this weekend’s games versus Life and Georgia have been canceled due to weather. Next up for the Dores will be a surging Georgia team loaded with young talent and strong goaltending. 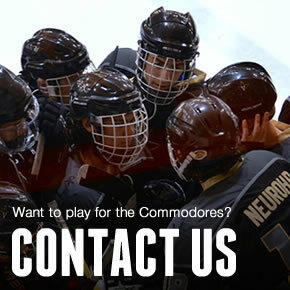 It’ll be a terrific challenge in the weekend leading up to this year’s SECHC tournament set to be played at the Ford Ice Center, home of your Vanderbilt Commodores. For fans and family scattered across the South and Mid-Atlantic, be safe this weekend. Thanks for your continued support and looking forward to hitting the ice again this week. Anchor down!